You are at: Home / Agora / Greek banks in intensive care: What lies ahead? Greek banks in intensive care: What lies ahead? Among the measures the Greek government has committed to legislate by July 22, according to the Euro Summit statement is the transposition of the Bank Recovery and Resolution Directive (BRRD). The urgent need for this legislation was somewhat surprising taking into account that in a press release published on May 28, the European Commission (EC) had requested 11 EU countries to fully implement the BRRD, with Greece not included in this list of EU member States. In a previous memo on the BRRD last year, the Commission noted Greece was among those countries that had introduced mechanisms at national levels to resolve failing banks. EC also noted that these regimes pursue the same objectives and are generally compatible with the BRRD framework. The BRRD lays out a set of common measures for EU countries to have harmonized resolution tools and powers to take rapid and effective action when bank failure cannot be avoided. 2) Transfer business to a temporary structure such as a bridge bank to preserve the essential banking functions or facilitate the continuous access to deposits. The most critical and sensitive measure is that of the bail-in, which was introduced for the first time and potentially applies to any bank liabilities that are not backed by assets or collateral. The bail-in does not apply to deposits protected by a deposit guarantee scheme or short-term interbank lending. The write-down follows the ordinary allocation of losses and ranking in insolvency. This means that equity has to absorb losses in full. After shares, losses are evenly imposed on subordinated debt holders and then evenly on senior debt holders. Deposits from SMEs and natural persons, including in excess of 100,000 euros, will be preferred over senior creditors. According to the BRRD directive, in circumstances of very extraordinary systemic stress the authorities may also provide public support instead of imposing losses in full on private creditors. However, such measures would only become available after the bank’s shareholders and creditors bear losses equivalent to 8 percent of the bank’s liabilities. Based on the latest official figures, Greek banks’ assets in Greece stood at 303 billion euros in the first quarter (Q1) of 2015 with the shareholders’ equity at 24.4 billion. In case of a bail-in equal to 8 percent of liabilities, this corresponds to 24.3 billion, which is equal to the banks’ equity. At the same time, Greek banks hold on their balance sheets preference shares of 2.3 billion (Eurobank 950 million and NBG 1.35 billion) as well as subordinated and senior debt of 5 – 5.5 billion. Summing up, the potential cushion to cover the 24.3 billion from an 8 percent bail-in on liabilities amounts to 16.3 billion (equity plus preference shares plus subordinated and senior debt minus DTA). This implies that around 8 billion have to be covered by a haircut on uninsured deposits. 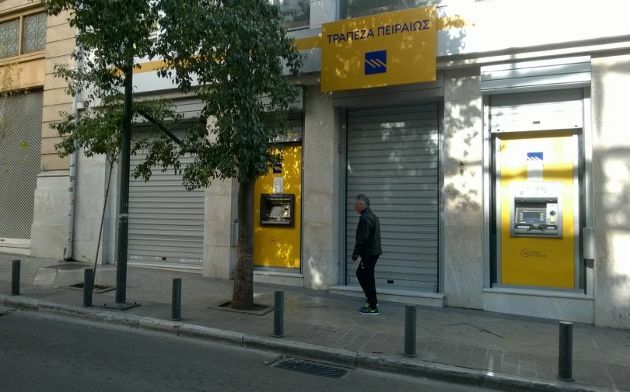 According to the Hellenic Deposit and Investment Guarantee Fund (TEKE) 2014 annual report, uninsured deposits amounted to 33.8 billion euros at the end of June 2014 corresponding to around 21 percent of total deposits at that time. Thus, a potential haircut of 23.7 percent on June-2014 uninsured deposits could result to the required 8 billion to cover the 8 percent bail-in on liabilities. It is apparent that since total deposits have dropped by 43 billion since June 2014 a much higher haircut has to be applied on the current level of uninsured deposits. According to bank sources, the bulk of current uninsured deposits relates to corporate working capital meaning that a potential haircut would definitely wipe out a large portion of their liquidity imminently threatening their viability. Apart from the general provisions of the BRRD, the ESM direct recapitalization instrument (DRI) is also operational for bank recapitalization as of last year. The DRI will only be considered if private capital resources are engaged first, in accordance with the BRRD. For a transitional period until the end of 2015, a bail-in equal to 8 percent of total liabilities will be applied. In addition, a contribution from the member state national resolution fund (TEKE in Greece’s case) will be made. At the end of 2014, the accumulated amount of TEKE to compensate deposits stood at 4.2 billion. From the beginning of 2016 the following three conditions must be met: a bail-in not less than 8 percent of liabilities, a contribution from the resolution funding arrangement up to 5 percent of liabilities and a write-down or conversion in full of all unsecured, non-preferred liabilities other than eligible deposits. The Euro Summit statement also indicated that a new ESM programme for Greece would have to include the establishment of a buffer of 10 to 25 billion euros to address potential bank recapitalisation needs and resolution costs given the acute challenges of the Greek banking sector. Of this amount, 10 billion would be made available immediately in a segregated account at the ESM. The statement noted that the ECB and the Single Supervisory Mechanism (SSM) will conduct a comprehensive assessment after the summer, which will determine the possible capital shortfalls of Greek banks. At the end of Q1 2015, Greek banks’ Basel III Common Equity Tier 1 (CET1) ratio stood at 12.7 percent, while the fully-loaded Basel III CET1 average ratio was at 10.6 percent. This means that a capital buffer is already in place to absorb a part of future capital needs. The non-performing (NPL) ratio of the domestic loan book edged up to 35.8 percent in Q1 from 35.4 percent at end-2014. In absolute figures, this corresponds to NPLs of 74.5 billion in Q1, up by around 1.5 billion quarter on quarter. At the group level, NPLs stood at 85.1 billion (32.6 percent of total loans) with a coverage ratio at almost 59 percent. In addition, Greek banks reported accumulated provisions (loan loss reserves – LLRs) of 50.1 billion corresponding to 19.2 percent of group gross loans. The evolution of the NPL ratio shows the highest annual rise was recorded in 2012 when NPL ratio rose by 8.5 percentage points to 24.5 percent. That negative performance reflected the strong recession of 8.9 percent in 2011 followed by a further GDP contraction of 6.6 percent in 2012. The new comprehensive assessment will certainly assume much harsher assumptions for the GDP compared to those (+2.9 percent in 2015 and +3.6 percent in 2016) incorporated in the last ECB comprehensive assessment published at the end of October 2014. Greek banks increased their loan provisions by 2.2 billion in Q4, in the aftermath of ECB stress test and another 1.1 billion in Q1. Piraeus also booked provisions of 2.1 billion in Q3, ahead of the ECB assessment. Overall Greek banks increased their LLRs by 8.6 billion in the last five quarters, whilst their NPLs rose by around 5 billion over the same period. However, the deteriorating macro conditions in the last few months, which intensified after the bank holiday and capital controls from the end of June, will definitely take a toll on their asset quality and capital base going forward. 1) Market concerns about the banks’ solvency also linked to liquidity issues. 2) The assumptions of the ECB/SSM comprehensive assessment coupled with the outcome of the stress test that will determine their possible capital needs. 3) The recapitalization process with a combination of several options and tools currently on the table. 4) Bail-in on deposits should be avoided in this extremely critical juncture since depositor sentiment (including corporate liquidity) will be seriously harmed both in the short and medium term. 5) Potential consolidation among the four systemic banks should not be ruled, particularly in case such a development would eliminate the deposit bail-in scenario.